In today’s cut-throat eCommerce market, retailers are turning to Dropshipping to send online orders directly to consumers. It’s a strategy designed to help businesses compete without spending more on inventory. Online store are more affordable, easier to manage, and create less overhead for the business owner. 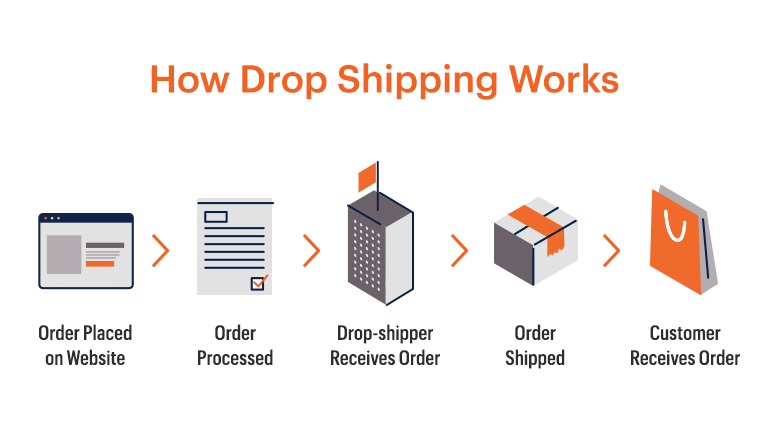 Dropshipping, simply put is when a retailer does not keep an inventory of their goods on hand, but instead works with a wholesaler that fulfills an order and also ships directly to the customer. This supply chain method is a great asset to starting an online store, but it’s not without its problems. Let’s talk a little bit about the pros and cons of using dropshipping. The main benefit of dropshipping is eliminating the worry of having inventory. When you work with a supplier, you don’t need a large amount of capital to get your online store running. Wholesalers have large amounts of inventory and a wide variety of products on hand. This allows sellers to offer customers a greater range of products. Not having to worry about supply as you create the demand can go a long way. It also reduces the stress of starting your own online shop, not to mention the fuss of packaging and shipping. Wholesalers will take care of that for you, shipping your orders directly to your customers. With these two big checks in the pro column, we can jump directly to the flexibility factor. You don’t even need a physical location. You can run your business from the beach, or the shopping mall, or anywhere with a reliable Internet connection. Dropshipping is not a well-kept secret. With its great benefits, many online retailers have already taken advantage of this tool. This in turn creates competition in the market. It will be hard to distinguish yourself from other online shops that are also offering a wide variety of products. And with competition comes the other downside, which is a loss of profit. Your profit margins will definitely take a hit while competing with your rivals. When reviewing the pros and cons of dropshipping, it’s like any other venture, benefits mixed with problems. It’s not a foolproof way to start a business, but it can be very useful to help you get started. Finding great wholesalers that you can trust is critical. The wholesaler is the backbone of your dropshipping business, so do your research. Luckily, dropshipping is not a new or untested idea. Many major retailers, brick-and-mortar as well as online stores, include dropshipping in their business models. Using wholesalers for dropshipping is on the rise, so there’s plenty of them available. But you should do your due diligence. How fast is the shipping and fullfillment? eCommerce has created marvelous opportunities for both big and small businesses. It has changed the retail world by connecting shop owners with customers worldwide. A virtual shop can now be every bit as profitable as a brick-and-mortar store, especially with a Magento Solution. And with the popularity and easy learning curve of dropshipping, anyone can try it–you don’t even need a lot of capital to get up and running. The most important thing is to arm yourself with knowledge.